This is another lesson I wanted to teach for so long: tangled words! This is a solid-hour video lesson including a variety of techniques: how to understand the importance of contrast when creating letters and words; how to use auras to improve legibility; working with contrast and complementary colors; how to create a GORGEOUS background using mooka 3d and so much more. EU, UK or Russian Federation try here. Soo many tips and tricks! Learn how to tangle and shade beautiful letters and words to form cards and personalized messages. Learn how to create super ornate words that you can actually read! I had so much fun with this project, I'm probably going to create more lessons on how to create ornate and embellished letters and words. This is only the beginning! It may sound strange to start learning how to tangle words instead of individual letters. In this lesson, you'll see how words need to be simpler than initials, to increase legibility. 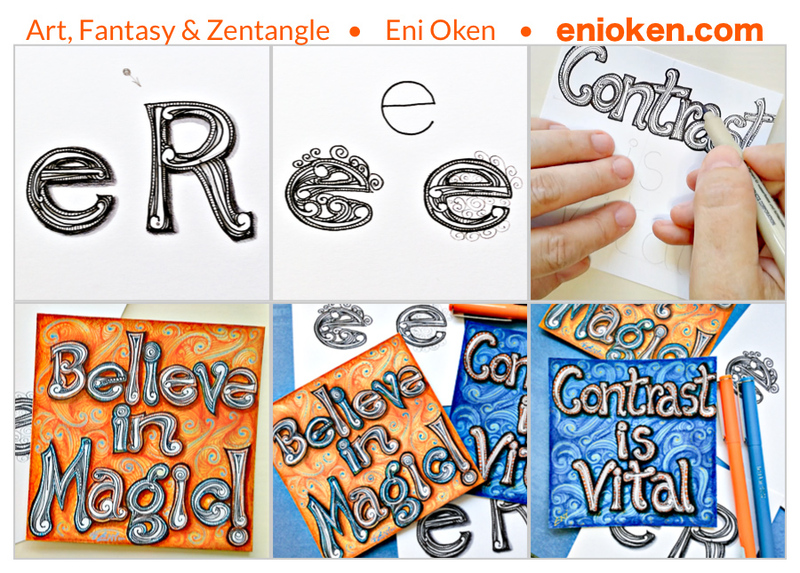 This lesson assumes you are familiar with the Zentangle method and tangle patterns. Although I use primarily Mooka 3D (see step-out below) to create letters, you can adapt and use other tangles!